Martin te Lintelo, Yokogawa Europe B.V., The Netherlands, discusses high level control system design for LNG receiving terminals. As demand for LNG increases worldwide, players face seemingly conflicting challenges. On one hand, they must expand capacity in different regions, make the business and production as agile and adaptive as possible, and improve operational efficiency. On the other hand, they need to improve operating margins while upholding contractual obligations. 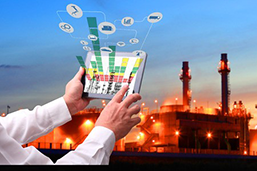 To meet these challenges, higher level automation and IT solutions are required to enable operators and engineers to effectively oversee the business and plants, while maintaining the quality and safety of operations. One of the key challenges of LNG receiving terminal projects is presented by the number of players involved and their roles. These typically include end users, stakeholders, design/engineering and construction engineering/ procurement contractors (EPCs), industrial automation vendors, and other suppliers. This diversity raises the possibility of a number of potential problem areas along with related risks and opportunities. These include technical aspects such as the design of the control system to provide the optimum level of dynamic operation, and the selection of the appropriate equipment to guarantee proper operation and controllability. More significantly, it raises questions in areas such as the training of inexperienced operators, and operational IT support of those processes where business and production come together. One significant problem area is a general lack of in depth LNG processing know-how and experience among the active players in the development of a terminal; they can have little experience in the midstream business sector and struggle to find suitable staff at the critical early stages of a project. This lack of knowledge can be complicated by the different ways in which LNG terminals need to be managed and operated. For example, the terminal might be 'dedicated', a part of some larger integrated operation, or a 'merchant' type that operates the infrastructure as a service for other players in the supply chain. Most LNG terminals so far have fallen into the 'dedicated' sector, but this situation is evolving, and looks likely to change with further maturing of the market. Figure 1. 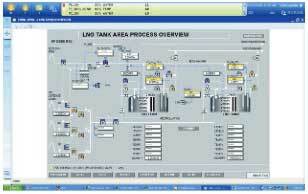 LNG tank area process overview: the use of dynamic modelling has proven to be very valuable in the recent past, not only for the training of operators but also to test and improve the dynamic side of operation and control. Traditionally, industrial automation vendors have relied on input by end users, EPCs or licence holders for guidance on the overall design, who, in turn, tend to need the support of highly skilled consultants or temporary staff during the early stages of an LNG receiving terminal project. However, the challenges and pressures of receiving terminal projects are increasingly opening up significant opportunities for the automation vendors to expand their role, and offer higher level solutions and consultancy. This can improve the execution speed and efficiency of projects, and with the right, close co-operation from the EPC and operator/end user parties, the automation vendor can improve the overall sophistication and performance of the control solution. What many EPCs have in common is the need to maximise their return on investment, which in turn leads to a risk averse culture that manifests itself in a mistrust of aspects that they do not fully understand, particularly anything that involves IT. This can lead to potentially serious problems, as the IT infrastructure of big projects is impossible to separate from the automation element. Higher level business management software relies on the data generated by the underlying automation, and the trend towards a more open, less vertically integrated LNG business environment only serves to increase the pressure on this aspect. Moreover, there is now EU legislation in place that lays down rules about the interoperability and openness of the IT infrastructure of LNG terminals, to help foster a more open and competitive business environment. As well as these organisational challenges, there are also new developments, internal and external, in the requirements for the operation of LNG terminals. These range from health and safety requirements, to the use of more sizes and types of carriers, more types or compositions of LNG, and new operational requirements, such as the option to load LNG and the need for more information such as reconciled mass balances. 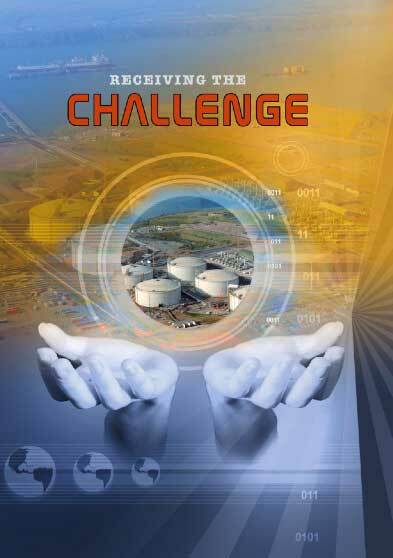 How can these challenges be addressed and solutions found to exploit the opportunities successfully? First there must be an acknowledgment, particularly by the end users and stakeholders, that these problem areas exist. But this process also involves the EPCs, which must also understand the whole nature of the development process, and the automation vendors, which need an awareness of the business processes involved. The key to successful project implementation is to acknowledge that this is not simply a technical or engineering exercise, but also involves complex human, management and economic interactions. This emphasises the need for co-operation between the automation vendor, EPC and end-user; with defined procedures to overcome the potential problems. An approach that has proved successful, particularly in the context of LNG, is for the automation vendor, (provided that it has the necessary multi-disciplinary knowledge and experience) to assume the role of main automation contractor (MAC). In this situation, they play a key role in design and implementation planning, and are involved in the parallel development of solutions within and outside the contractual relationship with the EPC. The implications for the automation vendor are that successful project implementation is dependent on far more than simply building a successful control system. Automating an LNG terminal involves not only the hardware but an in depth understanding of the process, which includes aspects such as operator training and the integration of the automation infrastructure, with the end user's IT operations and business processes. Even within the context of the traditional automation operations, aspects such as analytical instrumentation, asset management and production control have to be integrated into the overall operation. Figure 2. South Hook terminal. A description of the automation systems developed for these projects is beyond the scope of this short article. However, many of the risks discussed in this article played a role and demanded an adaptive approach on the part of the automation contractor. Highlights of some of the Yokogawa automation solutions devised include control system architectures that treat and operate the individual automation elements and process control involved as discrete functions; for instance, as an 'open-rack vapouriser' rather than a collection of lower level devices such as valves, heat exchangers, process transmitters, etc. 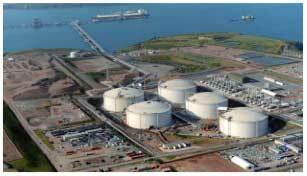 Such a high level approach helps to reduce both the degree of operator skill and manual intervention, that is usually required by operating staff of the LNG receiving terminal. In particular, the approach can dramatically reduce the number of 'nuisance alarms' that can occur during times when operators need all their attention to make plant operation safe and accurate, such as during the unloading of a carrier. At times like this, alarms of no consequence will often occur, such as a level measurement sensor flagging that a level is below some set lower limit. Control systems that are designed to operate at a higher functional level make it easier for such alarm situations to be foreseen and filtered or suppressed. Figure 3. 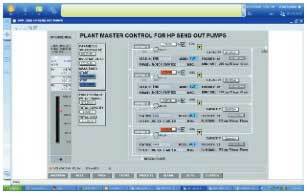 Plant master control for HP send out pumps: approaching the control on a unit-basis enables easy reusability of field-proven control, helps operators to stay in control and allows for the implementation of advanced control concepts. Another important aspect of high level control system design is that it makes it much simpler to increase the sophistication of control. Decisions that would normally require a skilled plant operator, such as determining the number and sequence of vaporiser units that might need to be turned on to fulfil an order, can be completely automated. This kind of control is increasingly the enabling technology that is giving receiving terminal operators much greater speed of reaction and flexibility, to deal with today's emerging dynamic LNG business environment. Only a few years ago, such plants, which were controlled with much more manual interaction, tended to operate on a daily cycle. Today, the increased flexibility of control is allowing operators to accept and react to nominations received as frequently as hourly, while also being able to apply sophisticated control algorithms to the underlying process, such as profiling the quantities of gas processed and delivered during different periods of the day. Such high level design approaches have been made possible by much closer co-operation between the EPC, automation contractor and end user during the early definition and contractual stages of projects. Another important aspect of some of these projects has been the use of advanced simulation technology to overcome the general lack of skills in the processes involved in LNG terminal operation. Yokogawa has supplied projects with an operator training simulator (OTS) that employs the same safety and automation system as the actual plant, with identical graphics and alarm behaviour. A high fidelity model of the LNG receiving terminal and regasification processes behaves exactly like the actual plant, and allows plant upsets and equipment malfunctions to be simulated offline, to educate and prepare operators for real-world operational situations. The dynamic model not only facilitates the training of operators, but also allows the designers to check for flaws in the dynamic aspects of the design. Having such a dynamic simulation environment attached to the actual control and safety systems, additionally supports the validation of process operating procedures. One final example of the adaptation that is being applied to LNG receiving terminal projects, is the provision of automation software in a service oriented architecture (SOA) environment. This is now part of Yokogawa's work for current terminal projects, which is designed to provide flexible support for open, merchant style LNG terminal services. The approach makes automation information available in a more flexible way, such that it can be utilised more easily in higher level business management domains. This is highly applicable to the midstream gas business, as the increasingly dynamic behaviour of the business potentially demands changes to the traditional business models, to support the operation of more open receiving terminal facilities.